The Chessie is possessed of a nature that is more protective and less welcoming to strangers than that of many sporting dogs, but that doesn’t make him bad-tempered. He is fond of and careful with children but will guard your home and hunting gear with alacrity. To a far greater degree than his more amiable cousins the Labrador and Golden Retrievers, the Chessie thinks for himself and does things the way he wants to do them. And really, who’s going to argue with him? That would be a waste of time. This is an assertive, confident dog who requires an owner with the diplomatic finesse and commanding presence of a Colin Powell. 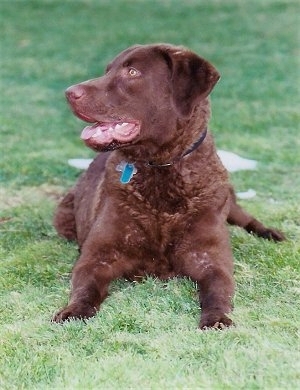 The Chessie is not the right dog for you if all you want is a companion. 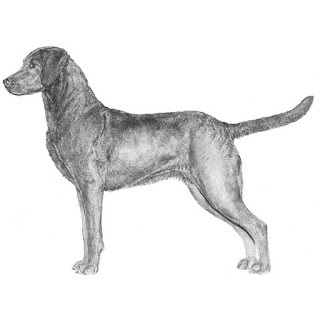 No matter how much exercise or training or dog sports or companionship you think you could give him, the Chessie is a hunting dog at heart. And not just any old hunting dog: he’s a waterfowling dog and lives to get wet in the quest to bring back his feathered quarry. 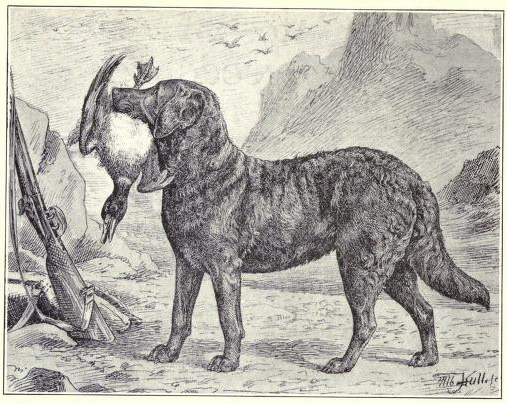 Limiting a Chessie to life as a pet is like blasting away at a duck with a cannon. That doesn’t mean he can’t also be a therapy dog or jogging buddy or family friend, just that hunting is his first love. The Chessie’s oily coat protects him in the water, but it also gives him a doggy odor. Chessies enjoy spending time with their family and should not live outdoors with little human interaction. Chessies are an uncommon breed. Expect to spend some months or even a year or more on a waiting list before a puppy is available. Coat appearance: Thick, harsh and oily. Water runs off the coat similar to a duck. 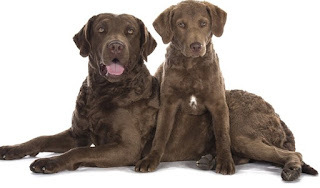 The Chesapeake Bay Retriever, which has an average lifespan of 10 to 13 years, is prone to some major health issues such as gastric torsion and canine hip dysplasia (CHD), and minor concerns like hypothyroidism and progressive retinal atrophy (PRA). Some other potential issues affecting the breed include elbow dysplasia, entropion, cerebellar abiotrophy, and Osteochondrosis Dissecans (OCD). To identify some of these issues, a veterinarian may recommend regular eye, hip, and thyroid exams for the dog. In many ways, the Chesapeake Bay Retriever is a classic retriever when it comes to behavior and training. They are loyal, easy to get along with, and don’t mind being put to work. This breed especially has been bred for water retrieving and other similar activities, so helping them understand their role in your family can include those sporty activities. Generally, a well-socialized Chesapeake Bay Retriever will be about as friendly as you can hope a big dog to get. Proper training and raising, as always, is important for any dog. 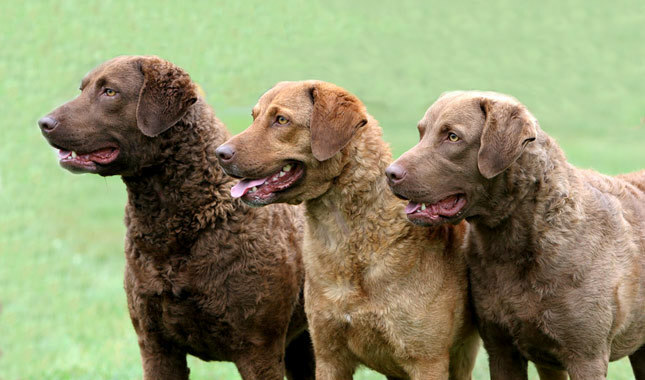 The Chessie has an oily, harsh outer coat atop a dense, fine, woolly undercoat. Dirt and debris brush out easily with a rubber curry brush. The undercoat sheds heavily in the spring, so be prepared to brush the dog more frequently during this time to keep loose hair from collecting on clothing and furniture. 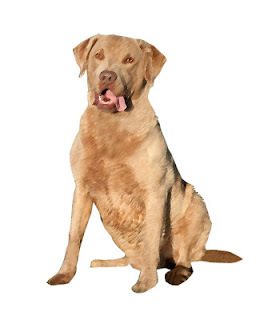 Give the Chessie a thorough freshwater rinse after he’s been in saltwater or swum through slime in a pond or lake, but to maintain the coat’s water resistance, avoid bathing him unless absolutely necessary. That can be as little as twice a year. The rest is basic care. Keep the ears clean and dry so they don’t get infected, and trim the nails as needed, usually every couple of weeks. Brush the teeth for good overall health and fresh breath. 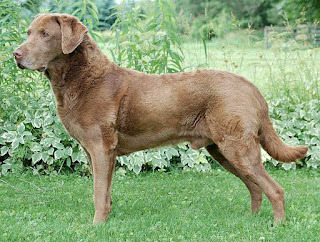 Although a wonderful breed for the family life, the Chesapeake Bay Retriever requires an outdoor environment with a lot of activity to truly be happy. 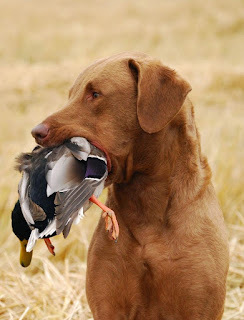 A natural retriever, it needs proper training and a confident owner to understand its own boundaries. While relatively inactive indoors, the Chessie is not at all recommended for apartment life and should have a very large yard, preferably with a swimming area for regular exercise. It will get along with cats if raised with them, but it may have an issue when introduced later in life and will most likely not get along with other dogs. 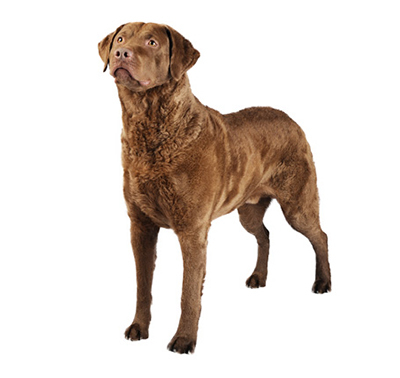 Simple to groom, the Chesapeake Bay Retriever does require regular bathing to avoid smelling fowl. 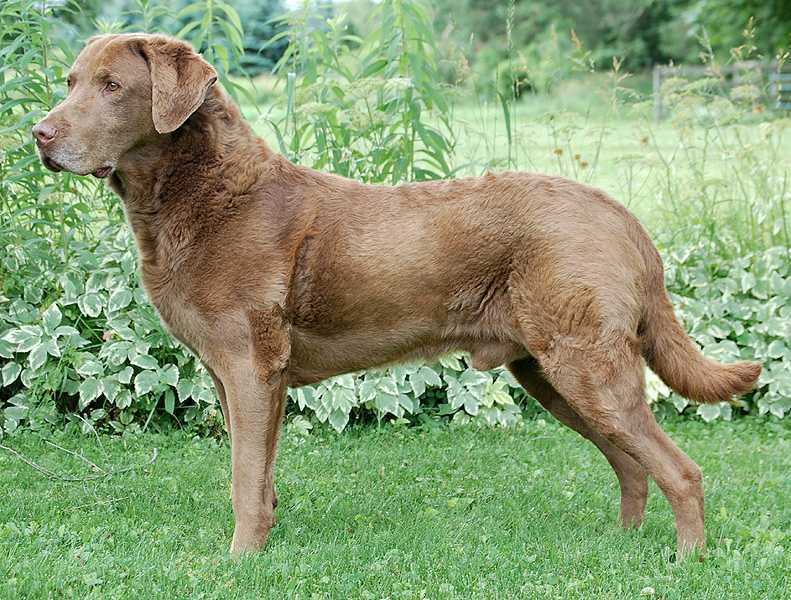 The Chessie isn’t hardwired to be a companion; he’s a hunting dog, pure and simple. And not just any old hunting dog - he’s a waterfowling dog and lives to get wet in the quest to bring back his feathered quarry. The Chesapeake Bay Retriever will be happy waking inside or outside, so long as it's cool enough. Going for a quick dip, it'll easily shake off the water to enjoy some downtime in the house with its family members. After a nice long hunt or walk, the Chessie would love to practice some obedience training and engage in a bit of play before heading in for the night. Regardless of where it is, this breed will always be on the lookout to ensure the home is safe and sound from human and furry intruders.